Based simply on #calories and fat, candy corn is the better bet. Because it’s so sweet, it’s hard to eat more than a couple 1-ounce packages (220 calories for two packages) and it’s virtually fat free. You can eat a lot of chocolate very quickly, and each one of those mini candy bars has about 45 to 80 calories. And although chocolate has more saturated fat, on the positive side it also has some antioxidants and calcium (keep in mind it is still not a #health food). So choose the chocolate minis — but only two or three. Fit Tip: If you want a chocolate taste with fewer calories, opt for mini York Peppermint Patties — only 50 calories and 1 gram of fat for more than a half-ounce portion. Gummy bears have fewer calories — 140 for 16 bears (1.5 ounces) — and because they’re so chewy and sticky, you may eat a lot less. But they offer no nutritional value, whereas pumpkin seeds are loaded with nutrients such as protein, healthy fat, iron, magnesium, manganese, phosphorous and other minerals. Unfortunately, they also pack on the calories: 180 to 200 for a quarter cup. I’d still vote for them, but be sure to watch how many you eat. The key here is knowing how many it’s going to take to satisfy your chocolate craving. If you have six Hershey’s Kisses (25 calories each) that’s 150 calories, whereas 1 ounce of chocolate-covered raisins has about 120 calories — not too bad if you buy 1-ounce bags — plus you get the health benefits of the raisins. And, if you eat them one at a time they’ll last longer then a few Kisses. Fit Tip: Why not have plain old raisins? They have iron, potassium and fiber, are low in sodium, fat free and loaded with antioxidants. While not a calorie bargain, they’re still healthier than either of the above. A very small box (1/2 ounce) can pack 45 calories — about one calorie per raisin. It’s a pretty close call: Rice Krispies Treats (90 calories, 2g fat, 18g carbs) are 10 calories less than a 1-ounce cookie (100 calories, 6g fat, 12g carbs). They’re also lower in fat and individually wrapped to help control overeating, all of which make them the better option. Not only that, but how many of us can really eat just one cookie? Fit Tip: For a cookie-like taste with fewer calories, try Miss Meringue. I’m a big fan of the chocolate raspberry flavor — only 80 calories for 13 cookies. Smarties, like their name, are the smarter choice. You can have two rolls of Smarties (total: 30 tablets) for just 50 calories. Skittles, on the other hand, have 170 calories per 1.5-ounce bag. Layer cake is by far the worst choice, at more than 400 calories. 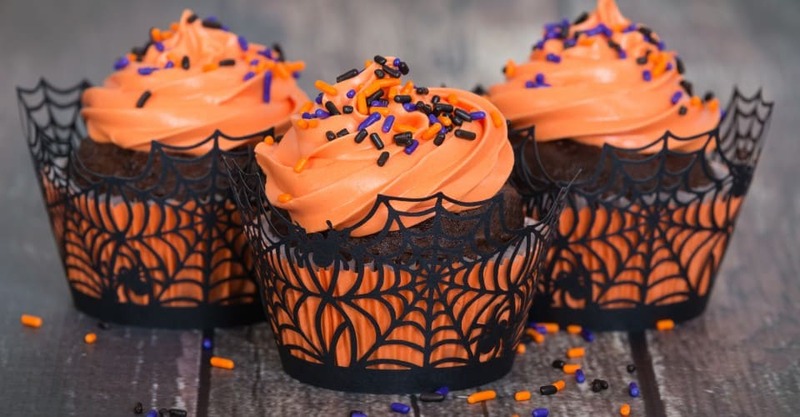 The cupcake and the pumpkin pie are close when it comes to calories, but since portion sizes are usually bigger for pie, a cupcake is typically your better bet. Definitely skip the whipped cream if you choose pumpkin pie — it adds 80 to 100 calories per serving. Oh, and a scoop of vanilla ice cream to make it “a la mode” tacks on another 270 calories. OK, this is a giveaway, but the point is the huge difference in calories: 60 to 80 for a plain old apple, compared with 330 calories or more for a candy apple. Tootsie Pops — about 60 calories each — last a lot longer than a single Tootsie Roll Midgee, which is about 25 calories. Perhaps you went overboard last Halloween, and it spiraled into a Thanksgiving feeding frenzy that became a Christmas binge, which turned into a 5-pound weight-gain — sound familiar? Well, this year will be different. Here are a few unusual and not-so-unusual tactics for treating your friends, foes and family instead of treating yourself. Take revenge. Bring a goody bag to your friend from cardio class (with a weakness for chocolate) who won’t stop bragging about her recent weight loss. Torment your siblings (especially if they were mean to you when you were growing up) by giving their children a little “extra energy.” Provide copious amounts of candy to your nieces and nephews and watch them bounce off the walls. Redistribute your extra candy to your co-workers, especially the ones you don’t like. You’ll earn brownie points when the 3 p.m. munchies set in, and they’ll gain the weight, not you. Reminisce. Send your old college roommate who never gained the “Freshman 15”a care package. Drive the teacher nuts. Give candy to your friend who teaches fourth grade to hand out as prizes for spelling bees or math contests, and let him deal with kids on a major sugar jag. Be a philanthropist. Drop it off at the local YMCA or children’s shelter. Keep it high: Place the candy for trick-or-treaters upstairs so you have to run up and down the stairs to get it — do this 10 times and you’ve burned about 68 calories. Walk it off: Take your children trick-or-treating and keep up with them! Three hours can burn 300 to 500 calories. Don’t go far out: Don’t buy Halloween candy too far in advance; you’ll have less time to eat it! Don’t enjoy: When buying candy for trick-or-treaters, choose kinds you don’t really like. Work it: Make your child’s costumes. Sewing burns about 100 calories per hour. Get full: Have a satisfying and nutritious lunch or dinner before trick-or-treating — you’ll be less likely to pick at the candy bag if you’re full! Keep it at 100: Today there are a number of 100-calorie snack packages that are perfect for Halloween. They include: Planters Peanut Butter Crisps, Oreos, Chips Ahoy, Pringles, Cheese Nips, Wheat Thins and Jolly Time Healthy Pop popcorn.